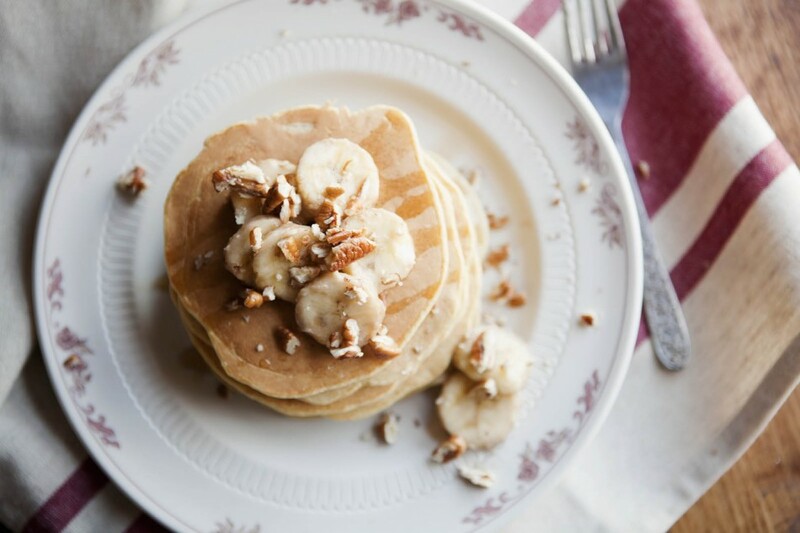 Roasted Banana Whole Wheat Pancakes | Naturally. Pancakes were one of the earliest things I remember watching my mom make. 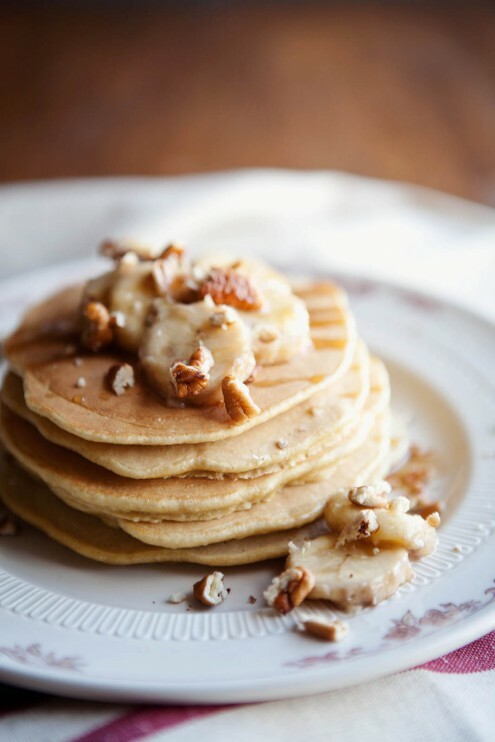 Granted, back then we used box mixes and doused our stacks in Aunt Jemima and Margarine (please don’t hold this against me…) Still, I remember studying my mom intensely trying to figure out how she got her pancakes so perfect. I failed at making pancakes for years. I know, it seems slightly strange that for someone who loves food so much couldn’t make something as simple as pancakes but trust me, it happened. I’m sure I’ll go back to that recipe but that’s just it. Cooking and baking is a lot of trial and error. There’s frustrating moments and moments that make me go, “can’t I just order in?” But once a meal clicks together, it’s magical. Preheat oven to 375˚ and place whole bananas (in peel) on a baking tray. Let roast for 15-20 minutes. Bananas peels should be dark brown and softened. While bananas roast, place pecans in a skillet and let toast for 4-5 minutes over medium heat. Seat aside. Turn off oven and place an oven-safe plate inside for keeping pancakes warm. In a medium bowl, combine all dry ingredients and give a good stir. In a separate bowl, mash one banana and whisk together with the wet ingredients. Pour over dry ingredients, stir just until combined-don’t over mix. If batter thickens too much (and isn’t easily pourable) and a bit more milk. Place in oven and continue with remaining batter. 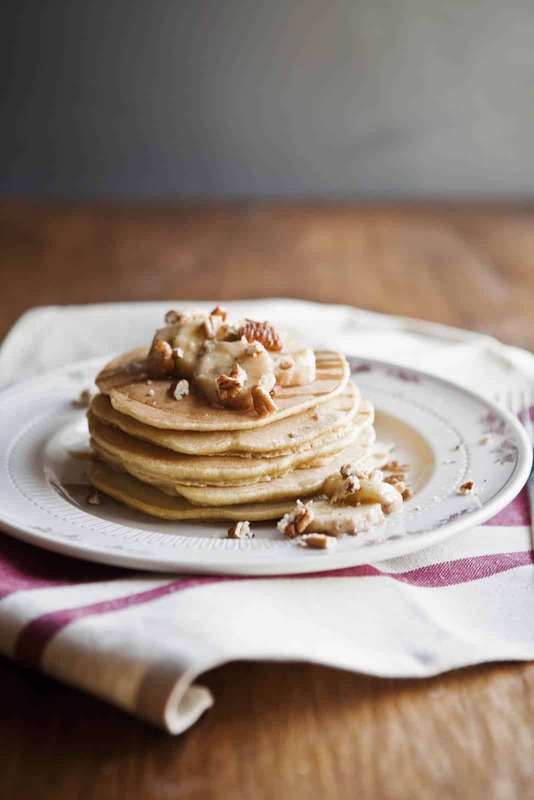 Top final pancakes with butter, pecans, remaining roasted banana, and a bit of maple syrup. Your banana pancakes look great! I thought for sure that pumpkin would be a fine sub for bananas in my recipe, but I guess not! What was wrong with them? They wouldn’t set up! I think that there is either a higher liquid content or I just used too much pumpkin (which would be my guess.) I’m going to try them again and tweak how much pumpkin I use! I bet that’s it. Please let me know if you get it right next time! I think a pumpkin oat pancake would be delicious. I grew up on pancake mixes too and for the longest time, didn’t know any better! Nothing beats pancakes made from scratch! This one looks awesome! Agree! Once I learned how to make pancakes from scratch I couldn’t believe I didn’t do it sooner! Is it strange that I can smell these pancakes through your pictures? Just stunning. I’ve just eaten my lunch and now I’m hungry again looking at these photos. Perfect recipe to try out this weekend – can’t wait! 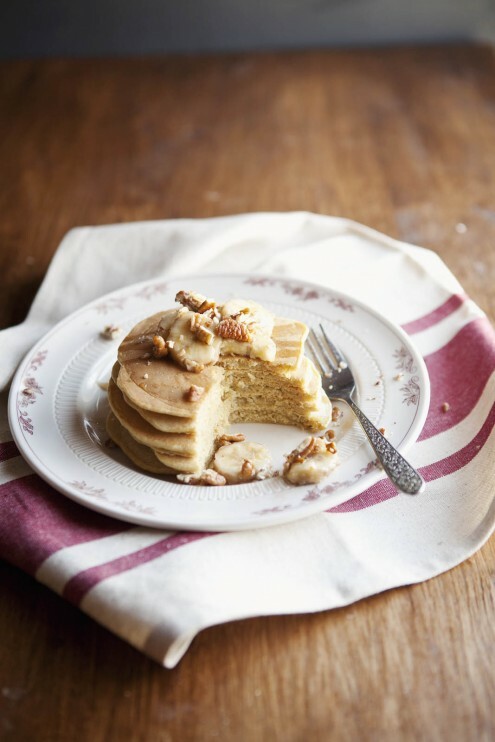 Not gonna lie…pancakes are my Achilles heel as well! Maybe I just need to try this recipe…and start singing to them as I go. Gorgeous photos! 🙂 The pancakes look so incredibly yummy too! I have never heard of roasting bananas – it sounds so delicious, but I doubt I ever would have thought of it! Thanks for the recipe – I can’t wait to try it out on my family! These are lovely! And I love bananas so much, I’m going to have to try this. Wondering the same thing. Seems smarter to leave the peels on from other roasting projects, but I am not sure? Anyone know? Would love to make these right now. Sorry I’ve been away from my computer! Peel on and the peel will brown around the banana! Great. Good to know thanks! It looks like delicious, beautiful and so yummie!!! This recipe looks delicious, and I have all the ingredients! Do you think this recipe would work for waffles too, or would I need to reduce the liquid and up the bp? I usually use this recipe for waffles as well without trouble- you might need to reduce the liquid just slightly, but not by much! I absolutely love banana pancakes! Your blog is amazing and your photography is unbelievably good. These pancakes reminded me of the banana bread pancakes this past Sunday..